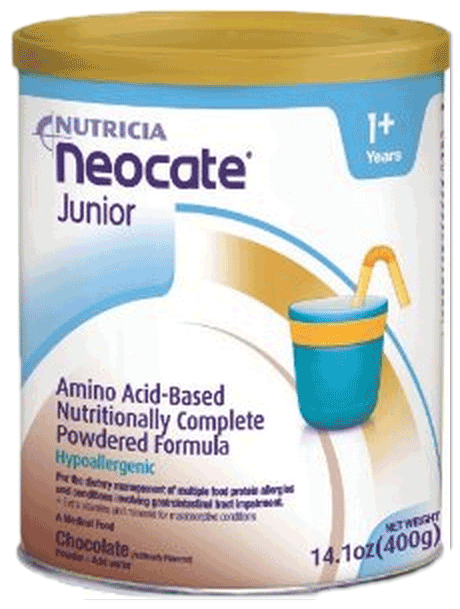 Neocate Junior is a Medical Food Supplement that is amino acid-based designed to help individuals with food allergies and milk allergies. 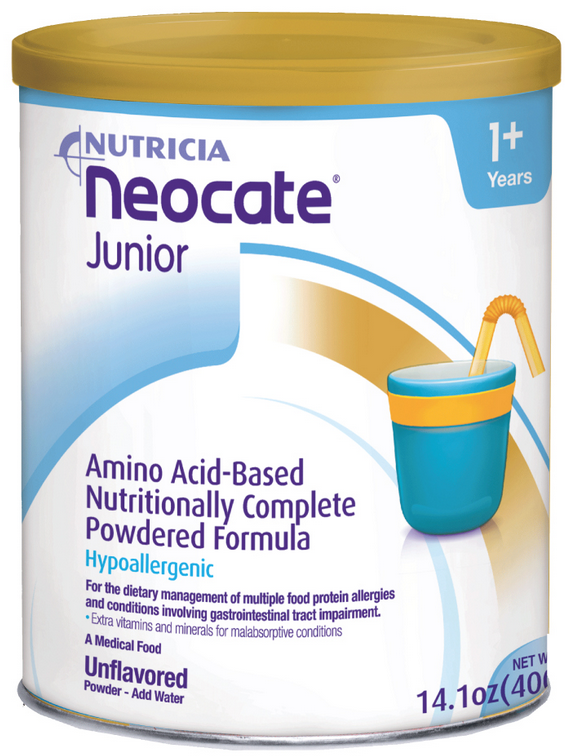 Engineered to help children with multiple food protein intolerance, Neocate Junior is a Dietary Management product for Gastroesophageal Reflux Disease (GERD), Eosinophilic Esophagitis (EoE), Short Bowel Syndrome (SBS) and other GI disorders. 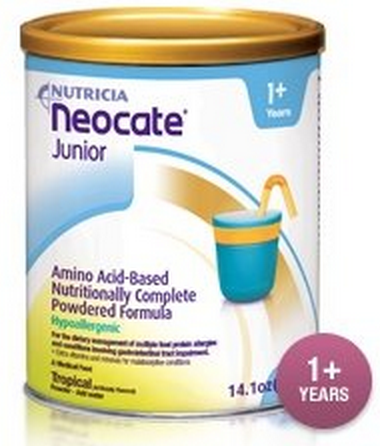 Manufactured by Nutricia, Neocate Junior is available in three different flavors: unflavored, tropical & chocolate. Fortified with extra vitamins and minerals, Neocate Junior is helpful for children 1 year old and above with GI-related mal-absorption disorders. Available in unflavored, tropical & chocolate. 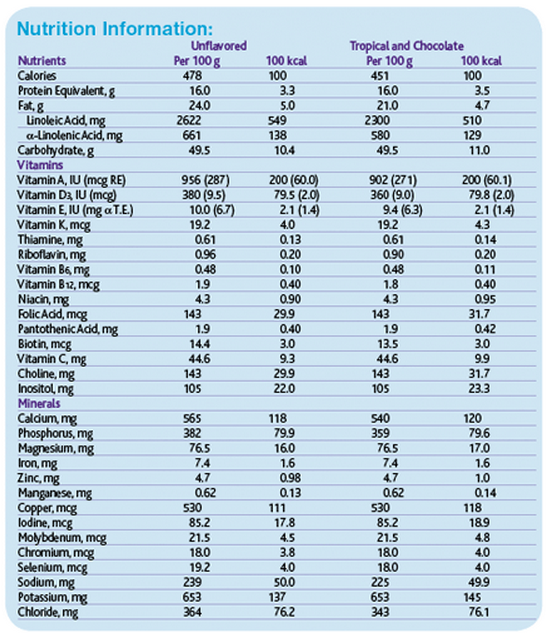 Tailored vitamins and minerals for mal-absorptive conditions. Neocate Junior Product Numbers: 12124, 12690, 11790. Size: 400 Gram, 14.1 Ounce. 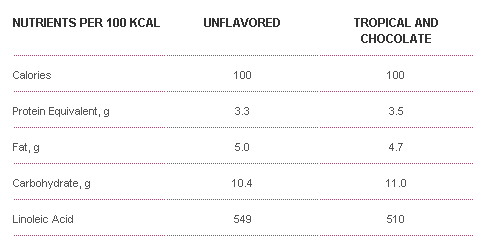 Flavors: Unflavored, Tropical Fruit, Chocolate. Standard dilution = 1 kcal/mL. Corn Syrup Solids (52%), Refined Vegetable Oil (Palm Kernel and/or Coconut Oil (8%), Canola Oil (8%), High Oleic Safflower Oil (8%)), L-Arginine (2.4%), L-Glutamine (2.3%), L-Lysine L-Aspartate (2%), and less than 2% of each of the following: Tripotassium Citrate, Calcium Phosphate Dibasic, L-Leucine, L-Phenylalanine, L-Proline, Silicon Dioxide, L-Valine, Glycine, L-Isoleucine, N-Acetyl-L-Methionine, L-Threonine, Mono and Diglycerides, Sodium Chloride, L-Histidine, L-Serine, L-Alanine, Magnesium Acetate, Calcium Phosphate Tribasic, Choline Bitartrate, L-Tryptophan, L-Tyrosine, Diacetyl Tartaric Acid Esters of Mono and Diglycerides, M-Inositol, L-Ascorbic Acid, L-Cystine, Propylene Glycol Alginate, Taurine, Ferrous Sulfate, L-Carnitine, Zinc Sulfate, DL-Alpha Tocopheryl Acetate, Niacinamide, Calcium D-Pantothenate, Manganese Sulfate, Cupric Sulfate, Riboflavin, Thiamine Chloride Hydrochloride, Pyridoxine Hydrochloride, Vitamin A Acetate, Folic Acid, Potassium Iodide, Chromium Chloride, Sodium Molybdate, Sodium Selenite, Phylloquinone, D-Biotin, Vitamin D3, Cyanocobalamin. Corn Syrup Solids (46%), Refined Vegetable Oil (Palm Kernel and/or Coconut Oil (7.4%), Canola Oil (6.8%), High Oleic Safflower Oil (6.8%)), Artificial Flavor (5.2%), Citric Acid (3.2%), L-Arginine (2.4%), L-Glutamine (2.2%), L-Lysine-L-Aspartate (2%), and less than 2% of the following: Tripotassium Citrate, Calcium Phosphate Dibasic, L-Leucine, L-Phenylalanine, L-Proline, Silicon Dioxide, L-Valine, Glycine, L-Isoleucine, N-Acetyl L-Methionine, L-Threonine, Sodium Chloride, L-Histidine, L-Serine, Mono and Diglycerides, L-Alanine, Magnesium Acetate, Calcium Phosphate Tribasic, Choline Bitartrate, L-Tryptophan, L-Tyrosine, Diacetyl Tartaric Acid Esters of Mono and Diglycerides, M-Inositol, L-Ascorbic Acid, Artificial Sweetener: Acesulfame Potassium, L-Cystine, Propylene Glycol Alginate, Taurine, Ferrous Sulfate, L-Carnitine, Zinc Sulfate, DL-Alpha Tocopheryl Acetate, Niacinamide, Calcium D-Pantothenate, Manganese Sulfate, Cupric Sulfate, Riboflavin,Thiamine Chloride Hydrochloride, Pyridoxine Hydrochloride, Vitamin A Acetate, Folic Acid, Potassium Iodide, Chromium Chloride, Sodium Molybdate, Sodium Selenite, Phylloquinone, D-Biotin, Vitamin D3, Cyanocobalamin. Corn Syrup Solids (44%), Refined Vegetable Oil (Palm Kernel and/or Coconut Oil (7%), Canola Oil (6.5%), High Oleic Safflower Oil (6.5%)), Artificial Flavor (7.2%), Sugar (4.7%), L-Arginine (2.4%), L-Glutamine (2.3%), L-Lysine-L-Aspartate (2%), and less than 2% of the following: Tripotassium Citrate, Calcium Phosphate Dibasic, L-Leucine, L-Phenylalanine, L-Proline, Silicon Dioxide, L-Valine, Glycine, L-Isoleucine, N-Acetyl L-Methionine, L-Threonine, Sodium Chloride, L-Histidine, L-Serine, Mono and Diglycerides, L-Alanine, Magnesium Acetate, Calcium Phosphate Tribasic, Choline Bitartrate, L-Tryptophan, L-Tyrosine, Diacetyl Tartaric Acid Esters of Mono and Diglycerides, M-Inositol, L-Ascorbic Acid, Artificial Sweetener: Sucralose, L-Cystine, Propylene Glycol Alginate, Taurine, Ferrous Sulfate, L-Carnitine, Zinc Sulfate, DL-Alpha Tocopheryl Acetate, Niacinamide, Calcium D-Pantothenate, Manganese Sulfate, Cupric Sulfate, Riboflavin,Thiamine Chloride Hydrochloride, Pyridoxine Hydrochloride, Vitamin A Acetate, Folic Acid, Potassium Iodide, Chromium Chloride, Sodium Molybdate, Sodium Selenite, Phylloquinone, D-Biotin, Vitamin D3, Cyanocobalamin. Intake to be determined by a healthcare professional and is dependent on the age, body weight and medical condition of the patient. Use under medical supervision. Neocate Junior is best served chilled. Once prepared, the formula should be stored in a refrigerator and kept no longer than 24 hours from the time of preparation. Shake or stir Neocate Junior immediately before use. The recommended dilution is 30 kcal/fl oz. This can be achieved by mixing the following amounts of powder and water. The scoop provided weighs 8.2 g.
Andorsky DJ, Lund DP, Lillehei CW, Jaksic T, Dicanzio J, Richardson DS, et al. Nutritional and other postoperative management of neonates with short bowel syndrome correlates with clinical outcomes. J Pediatr. 2001;139(1):27-33. Bines J, Francis D, Hill D. Reducing parenteral requirement in children with short bowel syndrome: impact of an amino acid-based complete infant formula. J Pediatr Gastr Nutr. 1998;26(2):123-128.
de Boissieu D, Dupont C. Time course of allergy to extensively hydrolyzed cow's milk proteins in infants. J Pediatr. 2000;136:119-120. Hill, DJ, Cameron, DJS., Francis, DEM, et al. Challenge confirmation of late onset reactions to extensively hydrolyzed formulas in infants with multiple food protein intolerance. J Allergy Clin Immun. 1995;96:386-394. Isolauri E, Sampson HA. Use of an amino acid-based formula in the management of cow's milk allergy and multiple food protein intolerance in children. J Allergy Clin Immun. 2004;113:S154. Kelly K, Lazenby AJ, Rowe PC, Yardley JH, Perman JA, Sampson HA. Eosinophilic esophagitis attributed to gastroesophageal reflux: Improvement with an amino-acid-based formula. Gastroenterology. 1995;109:1503-1512. Markowitz JE, Spergel JM, Ruchelli E, Liacouras CA. Elemental diet is an effective treatment for eosinophilic esophagitis in children and adolescents. Am J Gastroenterol. 2003;98(4):777-782. Miele E, Staiano A, Tozzi A, Auricchio R, Paparo F, Troncone R. Clinical response to amino acid-based formula in neurologically impaired children with refractory esophagitis. J Pediatr Gastr Nutr. 2002;35(3):314-319. Niggemann B, Binder C, Dupont C, Hadji S, Arvola T, Isolauri E. Prospective controlled multicentre study on the effect of an amino acid based formula in infants with cow's milk allergy/intolerance and atopic dermatitis. Pediatr Allergy Immu. 2001;12:78-82. Rudolph CD, Mazur LJ, Liptak GS, Baker RD, Boyle JT, Colletti RB, et al. Guidelines for evaluation and treatment of gastroesophageal reflux in infants and children: recommendations of the North American Society for Pediatric Gastroenterology and Nutrition. J Pediatr Gastr Nutr. 2001;32(2).92. Sampson HA, James JM, Bernhisel-Broadbent J. Safety of an amino acid derived infant formula in children allergic to cow milk. Pediatrics. 1992;90(3):463-465.